A student proposal to create an online pet supply company won the 2017 Robert K. O’Brien ’58 Next Big Idea Competition, which took place on Friday, Dec. 9. Senior Andrew Stoddard’s plan for Pet Supplies Giant—a one-stop shop for pet food, medicine, and other necessities—won the $2,500 first-prize. Junior Francesca Jandrow won second place and $1,500 for her idea to create StudTea, a café connecting area students over tea, while senior Brenden Murdock took third and $1,000 with his plan to create Quickstop Pawn Shop. This was the fifth year of the competition, which was founded and continues to be funded by O’Brien as a way to inspire students to start entrepreneurial ventures and promote inventiveness. This year’s judges were Craig Bovaird ’77, founder of Built-Rite Tool & Die/Reliance Engineering and chairman of the Worcester State Foundation Board; Judy Carmody ’88, Ph.D., founder and principal consultant of Carmody Quality Solutions; Jim Glickman, principal and founder of NAI Glickman, Kovoga & Jacobs; and Brenden O’Brien, son of Bob O’Brien. In his presentation to the judges, Stoddard said he hoped to create “the Whole Foods of the pet supply industry” by offering a subscription service for high quality food and by guaranteeing the safety of all products sold. He said the key to holding down prices and remaining competitive against existing industry giants would be using drop shipping, in which the products are shipped directly from the manufacturer, to fulfill orders. Jandrow’s idea was to reimagine the former Jillian’s Billiards Club into a meeting spot for local college students looking for a place to study, hang out, meet other students, and drink a variety of teas. Murdock hopes to improve the reputation of pawn shops by opening a store with more sophisticated displays of items for sale, and by including an online component. 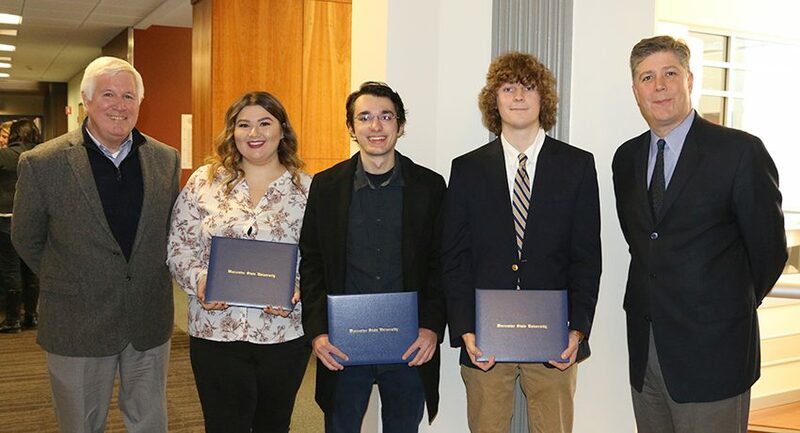 Although he couldn’t attend in person, O’Brien congratulated the students via cell phone, saying that all the written business plans submitted were so good that he was happy he didn’t have to make the final decision on the winners. O’Brien, who was celebrating his 83rd birthday on the day of the competition, had a long and distinguished career in business and helped launch 10 companies employing more than 300 people. He and his late wife, Barbara Hickey O’Brien ’57, for whom the Education Department is named, also established seven student scholarships at Worcester State, resulting in more than 100 full-tuition awards to date. 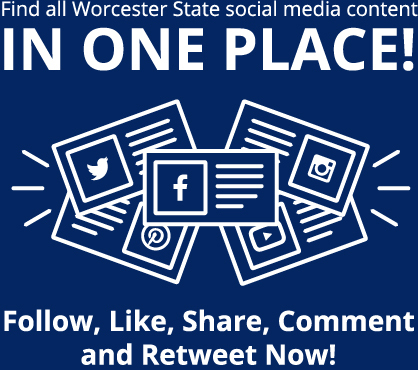 To prepare for the contest, students took the course Designing the Business Plan, taught by Ross Tsakas, Ph.D., a visiting instructor in the Business Administration and Economics Department, whose specialty is entrepreneurship and strategy. 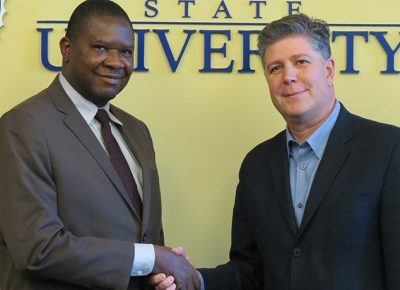 The first week of December showcased Worcester State University’s international partnerships, with high-level university officials from Portugal and Nigeria on campus, while a visiting faculty member from a Nigerian university offered a concluding talk on his research and classroom experiences this past semester. On Monday, December 4, Professor Emmanuel O. Aluyor, vice chancellor of Edo . . .